Why Convert to Headsail Roller Furling? • Safety - Going forward on the pitching foredeck of a sailboat is one of the most risky parts of sailing. Deploy and reef your genoa from the relative safety of the cockpit. It is simply MUCH safer and easier to handle any boat with a headsail furler. Especially if you sail short handed. • Performance and Reliability - These days, roller furlers are even finding their way into the mainstream racing fleets. Just look at the Around The World Campaigns for proof of reliability and performance. • Convenience - Save weight and space! Imagine getting rid of all those damp and mildewed sail bags stashed on your V-Berth! No more sails to get in the way of anchoring or have to fold on the foredeck! So why buy from The Sail Warehouse? We simplify the process for you. Even though there are many fine products on the market, some are quite complicated to figure out. Some units require that you select from a complex combination of components. Some require cutting the headstay. And some use non-standard size luff tapes which makes it more complicated to buy sails that will fit.That is why we have carefully selected the top brands that we believe are the easiest to understand, select and install. 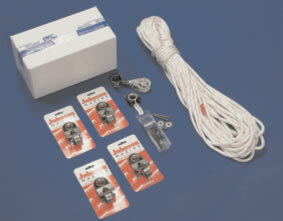 All the furling units we carry are also compatible with the sails we sell. All use the standard #6 luff tape. Finally, The Sail Warehouse often has the lowest prices! 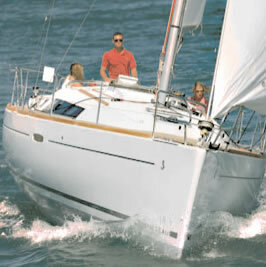 Plus you are entitled to a discount on any new sail with the purchase of a furler. So if you are ready, let's get started. To install most units you must actually measure the "pin to pin" length by ascending in a bosun's chair and measuring from the center of the clevis pin at the mast head all the way to the clevis pin center at the stem fitting on your bow. This dimension must include all turnbuckles and hardware on the wire. However, the "Pin to pin" can be estimated by running a tape measure up on the halyard for now. With this information you can go to the furler section and determine from the charts which units will work on your boat.The chart below indicates what sail luff will fit. Do I have to cut or replace the headstay? In most cases the units we carry are designed to be used with the existing headstay without cutting it provided the maximum wire diameter and turnbuckle screw will fit through the foil. See the chart associated with each furler for the maximum wire and turnbuckle screw size. Older Catalina 22's and all MacGregor models use an aircraft eye with a thimble which won't pass through the foil. For these boats we carry a replacement stay (see: Roller Furling Accessories) that is compatible with all furlers we sell. What size sail should I order? The general size of a headsail is described as: "Percent Overlap". This refers to how far back the sail comes in relation to the mast. It is determined by comparing the sail's "L/P" length to your boats foretriangle "J" dimension, (described here Measuring Sails in more detail). While it is true that you can use a large sail and reef it down to a smaller one, there are some limits to how efficient the sail's shape will be if you try to reef it too much. At some point it gets too baggy to have good windard performance. So it is best to try and match your sail size to your average saling conditions. Boats up to 25' often have a 150% roller furling genoa. Since the overall square footage of sails on small boats is less, even a large genoa still reefs fairly well. But for larger boats (30' and up), the most popular size is 135% which is large enough to drive the boat well in light wind but small enough to reef into a working jib and still keep reasonable sail shape. However if you sail in a predominantly high wind area (white caps more than half the time) you may choose a smaller furling jib known as a "Blaster". Usually 90% - 110% and possibly quite short on the hoist. Either way you may order a stock sail off the shelf or custom order to your dimensions. How do I determine what the sail dimensions are? 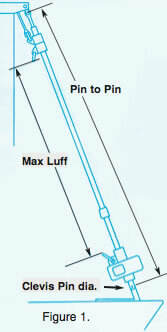 Once you know the "pin to pin" length of your headstay then the maximum luff length (Fig 1.) of the sail can be determined by using our Luff Calculator. Once you have decided on what percent overlap will work best for your type of sailing, you can determine what the "L/P" of that sail by using our "L/P" Calculator by entering your boat's "J" dimension. What other items will I need to order? You may wish to order a Lead Block Kit which has all the line and hardware to route the furling line back to the cockpit. Extra foils may be necessary if you have a longer headstay than the standard package can fit. See the chart for the furler you are interested in for it's maximum length. Replacement Headstays are sometimes necessary or desirable and we can supply them as well.